The Man in the Hole. 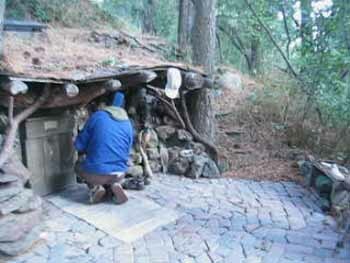 Dan Price, a modern day hobbit lives underground in Joseph, Oregon. Daniel Price lives in a hole in the ground. track, in a little hamlet called Joseph, way out in the boonies of Eastern Oregon. hit my camping pillow and Daniel faded into yesterday. to grab me as I whizzed by. his life to watch and wait patiently to bring a new friend into his hobbit-like world. In third world countries where people value people slightly more than money, this is common. In a white western middle class America, to stumble across it is a delightful anomaly. Left: Dan's WheelWiz trike in it's garage. 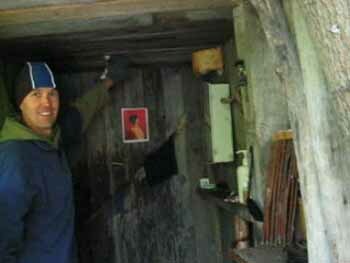 Right: Dan prepares to enter his 'hobbit hole'. and go tell it on the highways and byways. He pushes back a flap of flywire and turns on a light, motioning for me to crawl in. 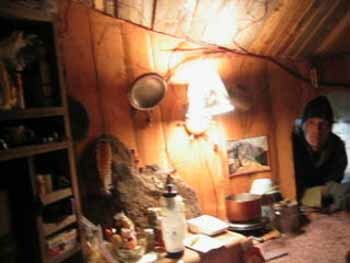 The kitchen side of Dan's 8-foot round underground house. I enter the a circular space, about eight feet round as he described, and lined with pine slats. There's just enough height to sit against the wall with legs straight out in front of me. The low ceiling is punctuated by a square skylight framing an overcast sky, and there is plush carpet underbutt. Going counter-clockwise around the space I see a stove, skillet, pantry, pictures, me on a mat. To my right - photocopier, little book case, CD player, phone, answering machine. Clothes hung on a stick. Then the door again. There are no cupboards or chests of drawers. 'Everything is at arm's length when you are sitting there. It's human scale, says Dan. 'The idea is that you can see everything, no fumbling for stuff - that creates stress'. Dan is not living completely off the grid - though he's definitely off the gridlock. There's underground electricity powering his lamps, and photocopier. 'But next year, I'm switching to propane so I can be completely off the grid. So what does he do to pay the miniscule electric bill and fill his small frypan? He doodles. His mission: to draw the world as he strolls, hikes and trikes through life. live vicariously through his minimalist life while slogging it out in the city by day, suburbia by night. never notice because you drove past them too fast, like the corners of buildings seen at a strange angle. Whatever Dan is doing today, you might read about in the next edition. Composting outhouse complete with skull and literary sentiments within. 'I've worked out it you can live on around $5000 a year,' he says. Yes, this is America. Even a hobbit has to pay that electric bill. 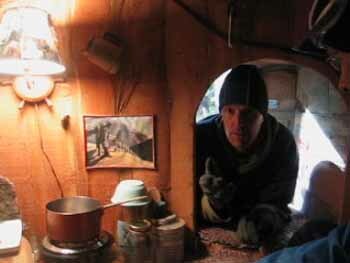 He rents the piece of land he's living on for $100 a year. you can read the bureaucratic-sounding job description and letter of offer in one of his Chronicles. 'It's a non-stressful, outdoor job,' he says. Dan is no vagrant hippie with his hat permanently upturned. his skillet with nourishing organic veggies. 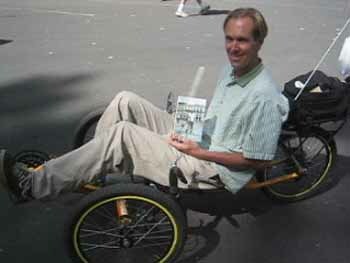 Dan with trike and his copy of 'The Handsomest Man in Cuba'. Sierra Designs gave him a tent. Patagonia gave him a jacket. Simple Shoes shod him for several years until there was a change of management. Who's this dude? Yeah, my kid can draw too - can it! WizWheels gave him a $2000K trike to explore the world and draw what he saw by trike-cam. Florida before road rage drove him to turn around and flee back to his hole. Sakura provide him with a supply of Pigma Micron archival quality pens to felt-tip his forays into eternity. decorated wild-west style with a cow's skull and Thoreau-like quotes. out channels in the former swamp, thus making a meadow out of marshland. 'I just read books on it and surfed the internet for ideas,' he says. Left: Dan and his gravity-fed shower. 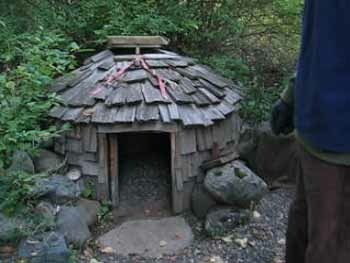 Right: Propane-powered sweatlodge. Beside the stream is gravity fed shower, heated by an electric current. 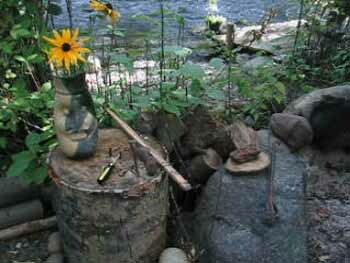 chair made from found objects and sticks, and a graceful pottery vase with a single fresh bloom. Over there, past his jocks and socks drying on a rope between two trees, is a sweat lodge made of shingles. A propane burner gets the little hothouse hotter'n jalapenos and the lodge is just big enough for two people and a prodigal son. Shades of Henry David Thoreau's Walden shuffle to mind. He buys a copy of my book The Handsomest Man in Cuba and reads it that day. When you structure your life by putting you first, you have time to do things, like read books. 'I used to work as a photojournalist with regular crazy hours. The problem is, people have their lives organized so they are the slaves. Basically, the average person spends a ton of their time working for very little money, just to survive. driving to and from work in the dark in a traffic jam. 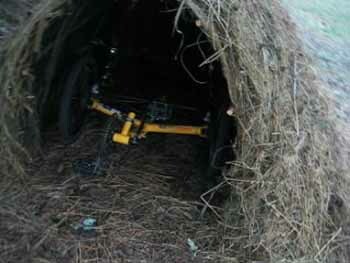 His body is precisely where he wants it to be - in his cozy hobbit hole, on his trike, doodling all the way. 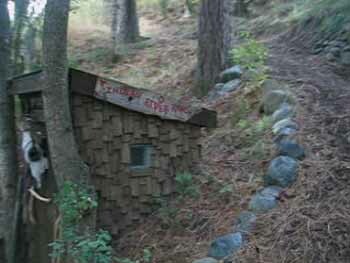 Write to Dan at his hole in the ground, Moonlight Chronicles, Box 109 Joseph, Oregon, 97846. 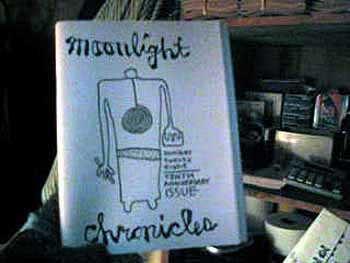 To subscribe to Moonlight Chronicles, enclose $5 or more per forthcoming issue.